Abstract - Across the world, government agencies and industries are planning for the impacts of climate change—some dramatic and life threatening, others subtle but costly. But the data center industry, which underpins so many critical activities, appears to be taking a relaxed approach; and only a detailed site-by-site analysis will reveal if it is complacent. 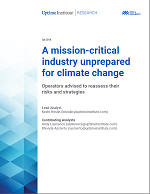 This 25-page report by the Uptime Institute Research team follows up on 2018's Data Center Industry Survey Report, providing new research into the state of the global data center industry when it comes to climate change. Readers of the report will learn how critical infrastructure teams can take steps today to evaluate risk and plan for future impacts across their portfolios.